In the 1947 movie, The Ghost and Mrs. Muir, there are two granny style afghans belonging to Mrs. Muir that are very noticeable. One is a granny motif afghan while the other looks like this one here. I loved the second one so much I decided to redesign it for Crochet Spot. 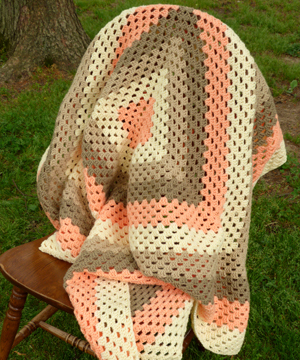 This afghan is a perfect square that you can adjust to make as large or small as you desire. There’s no turning involved with this pattern so the right side of the stitches will all appear on one side. Have fun mixing and matching colors to make this granny square inspired afghan your own! This entry was posted on Thursday, May 15th, 2014 at 12:00 AM by Amy	and is filed under Best Crochet Patterns. You can follow any responses to this entry through the RSS 2.0 feed. You can skip to the end and leave a response. Pinging is currently not allowed. Done that afghan so many times over the years. Never thought to write down the pattern, it’s just another granny. I’ve made many afghans using this technique – one large, make that humongous! granny square for all the members of my family. It’s easy to change colors to customize to the person you’re making it for. It’s easy enough for beginners and relaxing for us more experienced folk. Exactly Darlene and Lynne! It’s a basic pattern that’s fun and simple to make with no limit to the color patterns. Lynne, I love that you’ve made such a big one. A pretty large undertaking, but I adore granny square blankets. I think I’ll have to do that next! I absolutely loved that movie. Thanks for the reminder! You’re very welcome. If you’d like to read more of what I wrote on both the movie and afghans, you can read my blog post at http://tinyurl.com/m6dsjxa (Over the Horizon). My mother’s favorite movie! Thanks for the pattern. What colors and brand of yarn are used in Mrs. Muir’s crocheted afghan??? I’m confused. Wasn’t that a black and white movie? How do you know the colors used? The colors are simply my choice. I have no idea what colors were used in the original blanket, though it would be fun to find out. You can use whatever colors you choose. No problem. 🙂 And thank you! I attempted this afghan but as I progressed around it became “wop sided” for lack of a better word. How can I remake this and have it square as it should be? Thank you. Can you describe “wop sided”? Does it only have three corners? All four sides should be even, where is it not? I see now what you mean by “wopsided”. Despite the fact that you are working a square, the continual round IS creating a slight pinwheel effect. Mine did the same, just so you know, and I wondered why but I also didn’t mind it as much. What they said on the forum about turning every round is the answer. Meaning: in many patterns, at the beginning of each round, you are often told to chain so many and then “turn” before continuing the stitch pattern. In the case of my pattern, you do not turn. Turning with my pattern will change the way the round is begun and ended but should not change it in any other way. So if you want your square afghan to be perfectly square and not resembling a pinwheel, it appears as though you will need to turn every round instead. There is one other thing to consider and that is the gauge. If you use a slightly larger hook this might cut down on how ‘wopsided’ the blanket turns out. My apologies for not foreseeing this, and for the difficulties this must have caused you. Thank you Bill, for your patience! And I hope the rest of your crocheting goes without a hitch. Amy, thank you for your reply. I am not a deeply experienced crocheter and am confused about turning in order to achieve the true square. You say turn every round. Pretend that I am in kindergarten and tell me again what to do. I really appreciate your help since I still have my yarn and would like to complete the project. Okay Bill, I have sent you an email with the rewritten instructions. Hope it clarifies things for you! Amy, thank you, thank you. As soon as I finish my current project ( a hooded knit sweater for my daughter’s old school girlfriend due in March) I will attempt Mrs. Muir again. Again, thanks so much. No problem. Glad I could be of assistance! Amy, I just finished Mrs. Muir’s afghan. Yes, it has taken me a while (put it down, pick it up) but it’ s finished slightly abbreviated. How do I block it? Is the Caron one pound washable? If so, any special instructions? Thanks. Congratulations, I’d love to see it! To tell you the truth I have mine still sitting in a box awaiting more length and tassels. So don’t feel bad, lol. I have not dealt much with blocking, unfortunately, so I can’t give you any information in that area. As for the washing, the label says it is machine washable and it has worked well for me. Though if you want to cut down on the fuzziness I might recommend the delicate cycle. I finished my Mrs. Muir afghan (abbreviated to 44 in. Square) and tried to send you a pic, but for some reason it wouldn’t cooperate. It turned out good and I did wash and dry it on gentle. Thanks for all your help. No problem, Bill. It was a pleasure!